The Meccano Shuttle was introduced, along with the other special loom parts, in 1916. It was the most expensive spare part until the Geared Roller Bearing in 1928, and of course has only one use. We can probably assume that there was a limited market for this part until it was added to the new largest outfit (number 7) in 1921. It was also supplied in the 7 outfit's replacement (the Outfit L) in 1934. With the new numeric outfits 1 to 10 in 1937 the shuttle and many of these special parts were dropped, although it was still available as a spare part until production stopped in 1941. It was never reintroduced. There are two common varieties of the shuttle. The difference is fairly obvious – the earlier ones have a groove down each side and a plain rod as a bobbin. Later versions lose the grooves, but gain flanges on the bobbin to help the thread stay in place. It is believed that this change dates from around 1930. Well-dated outfits of 1929 have the earlier type stamped MFEA, and 1933 the later type. DMS/EMP show an earlier type, from 1916 to 1920, with a much simpler design. The bobbin is held by two hooks from a much plainer frame. More information on this would be interesting, if anyone has one. Within the first type, I have noticed at least three clearly different variations. They are shown in the picture to the right. On the left is a very sharp-cornered shuttle, stamped Meccano twice in a circle. In the middle is a similar type, but with all the edges considerably more rounded, including at the transition to the shaped end. This middle one is stamped MFEA, dating it from between 1921 and around 1929. 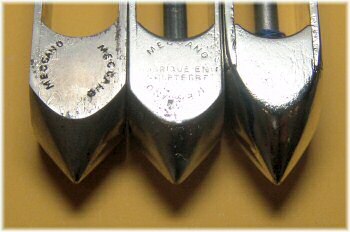 The right-hand version is even more rounded, with longer and smoother points at each end, stamped only Meccano. It would be interesting to research which of these varieties is the most common, and whether we could attach any further dates to them. Well would you believe it? Here's a picture of an extremely rare boxed shuttle, courtesy of Dave Taylor and Richard Payn. You might as well remember what this looks like as it's unlikely you're going to see another one! I have the very same as mr. Peirson, as far as I can conclude from the description. Mine was in a approx 1923 6A outfit where it should be and I have no reason to suspect its genuinity. I need stronger proof to take it as a repro. 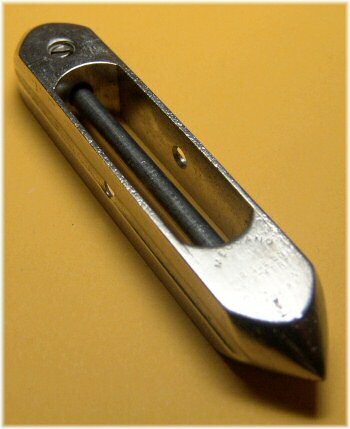 Hi, I have a shuttle with sharp edges, side grooves and a plain rod, suggesting it is an early type. It does not have any markings on it at all. The plating is still in good condition so it is unlikly any marks have worn off. Can I be sure it is Meccano? Reply: It is almost certain that any unstamped shuttle is a reproduction. Many people have made these in the past as they were discontinued during WW2. I have absolutely now way of knowing if this story is genuine or not but I have a shuttle given to me by a friend in Liverpool that I was told was made in the factory during the 'sit-in' following the problems with the company. I want to make by myself this item on mij lathe. Because the price is in Europe more than € 60,00. I am searching voor de right dimensions length, width en hight. Can you help me, please.